We understand that in agritech the motors and controllers you need are stringently specified. Whether it be a drive system in which the power to weight ratio has been carefully optimised or a robotic system in which the torque and speed requirements are fixed, you need the optimal solution for your project. That’s why we work hard to deliver a range of fully customisable and programmable controllers to deliver the performance that you need when you need it. Whether it’s a brushless system that can be quickly modified to include absolute positioning or a drive system that has to be optimised for constant torque, we have the knowledge and the tools to deliver. One of the key advantages of our controllers in applications such as Agritech is that we can incorporate intelligence into them. This means that you don’t need to rely on the central control unit to manage everything for you but can simply send instructions to the controller and it will carry these out. 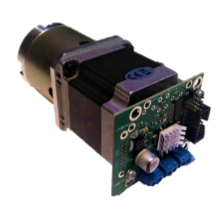 Typical examples include agritech drive systems in which the motors can accommodate for the changing terrain and/or gradients and be optimised for this change in resistance. This simplifies the process for the designer and enables you to get on with the job of building the robot and finishing the project. For more in depth projects that require extensive R and D or a completely new driver developing we can work with you to develop the specification and design that’s needed and then implement. From the conception stage right through to testing, our experienced UK based team can be with you all the way. We’ve worked in a broad range of applications with clients from small startups through to major firms listed on the stock exchange so we know whats required (we’ve even designed control solutions that have gone into F1 applications and satellites). We love the challenge of working on cutting edge, exciting new projects where the main reason we don’t have a stock solution is that no one’s asked for anything like it yet! We’ve worked on a huge array of projects, from automotive to pumps and process control and laboratory equipment. We’ve had controllers go into space, around F1 tracks and more. We understand the range of challenges that need to be met to create successful, reliable solutions. To find out more about some of the projects we’ve worked on you can have a look at our case studies and applications page. Alternatively, if you would like to talk to one of our team or arrange a meeting to discuss your requirements you can contact us directly here.